Forgive this post if it is in the FAQ; I looked but didn't see it. I am a (shudder) amateur who has tuned my old Everett studio piano 4 or 5 times. I was well pleased with the result, and was able to set the pins well enough so that the tuning was very stable for months and longer. I purchased the Schaff tuning hammer directly from Schaff in the early 1970s, as part of a tuning kit. I haven't tuned often because it takes me 4-5 hours to do the job to my satisfaction. 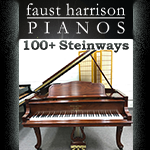 I've since sold this piano and just purchased a new Hailun 178 grand piano. When I placed my hammer on the pin to tune it, the tip didn't seem to seat properly on the tuning pin. It seemed to sit on top of the pin and wouldn't go down far enough to completely sit on the pin. When I used a Schaff-Hale hammer in the shop, it seated just fine. Is what I need a larger depth tip? If so, is there any "standard" size that should work? I also see that there are head angles of 5, 10, and 15 degrees. 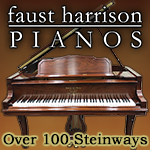 On pianoworld.com a 17B-10 head and tip is recommended for grand pianos. Does this mean that it is a different size than what came with the Craftsman, and that I need this 17B-10? Guidance, suggestions, and recommendations are appreciated. I do intend to have a tech tune the piano periodically. I'm not sure whether I'll just touch it up occasionally, or whether I'll do a full tune. But I really hate playing a piano even a little out of tune, so I want to be able to do the job. This is a common problem. You just simply need the next size up tip. Schaff has #1-#4 size tips. 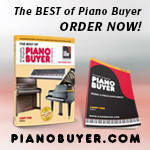 Pianotek has #1-#3 tips. Both companies' tips fit differently on whats called the broach of the tuning pin. Commonly this problem happens when a piano is restrung with a size #4 large tuning pin from the original size #2. And Some companies just use a bigger pin in construction. Either way you just need the next size up tip. I prefer the Pianotek Watanabe (japanesse made) tips. As for the head of the lever- I like between 5-10. Any higher angle hurts my wrist. But that is just me. Many fine tuners use 15 and higher with no problem. You will find that you will want to carry more than one head and tip. Having a varity will give you more combinations to work with when you deal with spinets where the pins are too close for a standard tip or clearing tall plates in grands. Or even where old upright have that knuckle busting over hang from lids that fold in half instead of straight open. Not to mention some european pianos with smaller pins like numerous birdcages. Also the tips can wear out which maybe why the ones in the shop work just fine (just a guess). Last edited by Josef; 03/30/09 09:17 PM. Thanks for your reply. But I do have some questions for clarificatioon. 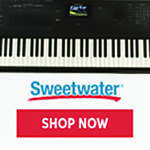 Looking at Pianosupplies.com, I see 14B and 17B tips. Evidently the increase in number means a physically longer tip. Evidently the 17 length is more helpful for grands because it lifts the lever handle higher to physically remain unobstructed while in use. In which case this number will not help solve the immediate problem of getting the tip to completely swallow (fit over until it reaches the bottom) of the tuning pin. Is that right? Also, if I understand that a #2 star tip is the one typically supplied with a hammer, and you are suggesting to try a #3 or higher. This larger size would then allow the tip to completely swallow the tuning pin. Is that what you mean? Wouldn't this larger size tend to wobble on the pin (have excessive play instead of fitting snugly), since it is larger? When I visually inspected the tip that worked well seemed no larger than mine at the opening. Of course, small differences would only be revealed with careful measurement with an appropriate instrument. I've always used a 10 degree angle also. I'm not sure why I'd need to change that. BTW, I erred when I thought I had a craftsman hammer. It looks more like a student. I'm guessing that this is immaterial. So whether or not I opt for a superior hammer, it looks like a #3 star tip is what I need. I may need a physically longer one (like a 17) if my particular piano requires clearance to be able to allow the hammer handle adequate space to travel. You are more than welcome. More Advice is that if you are gonna stick around in this business you need to get an account started with the big supply companies. Look up Schaff and Pianotek. They are great friendly people to deal with and When you get the catalogs then you can order higher grade tools and such. Their tips numbers will match what I stated above. Thanks again, but I repeat that I am an amateur. I primarily intend to tune my own piano, because I think that anyone who plays an instrument should be capable of tuning it. I don't know how much or how often I'll do it, but I have done it before and I want to refresh and improve my skills. Possibly, I'll tune for free at a church or community, but that's pretty unlikely. I'm getting a #3 star! Having tuned pianos for decades, with pins of all sizes, I have never once changed the size of the socket. That is why the tuning pin heads are tapered. Impressive. What Kind of lever?